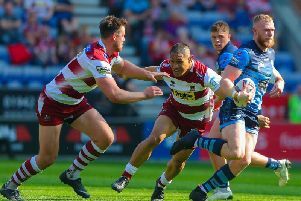 Saints are taking more than a passing interest in events Down Under where former Huddersfield Giants centre or second rower Joe Wardle is set to leave the Newcastle Knights. Wardle, 25, signed a three-year contract with the NRL club at the end of the 2016 season and was part of a player swap between Jake Mamo and himself. But it seems he is suffering from home sickness and has revealed that his career in Australia will draw to a premature close at the end of the season and he will return to Super League. It is believed the Knights have given their nod of approval to his request and while current Super League table-toppers Castleford and Warrington Wolves are heading the list of interested clubs, St Helens will be monitoring the situation and what develops in the next few months. Wardle came through the ranks at Bradford Bulls after signing from Illingworth ARLFC. and made his debut for Bradford against Warrington Wolves in the 2010 Challenge Cup. At the end of the 2010 season, he rejected a new contract from Bradford, and instead signed for Huddersfield Giants. Wardle came through the ranks at Bradford Bulls after signing from Illingworth ARLFC. Wardle made his debut for Bradford against Warrington Wolves in the Challenge Cup in the 2010 season. At the end of the 2010 season, Wardle rejected a new contract from Bradford, and instead signed for Huddersfield Giants. Wardle was named the 2014 Huddersfield Giants season’s player of the year, establishing self has one of the best defensive centres in Super League. Wardle is a Scotland International representing his country on six occasions between 2010 and 2014, Wardle is expected to make a decision between Castleford and Warrington within the coming weeks.